I really have no opinion to share ahead of the inquiry. However, the destroyer should have been maintaining a plot of every nearby vessel and it's course and speed continuously. That is SOP on a military vessel. There are redundant radars and other systems to ensure this can be done, equipment failure should not have been a factor. The CO and the officer who had the con at the time of the accident have flushed their careers away. Maybe they were on Facebook at the time? Here is the minute-by-minute account of the ACX Crystal's journey and try and tease out what we can from it. Above you have the AIS data from what I believe covers the entire horrific event, and the ACX Crystal leaving the scene of the collision. Yes. LEAVING the scene, only to return an hour later. I'll get back to that. I believe this shows that 1) nobody was on the bridge of the Crystal and 2) "Iron Mike" was in controls for a full 15min *after* the collision; see item 1. There have been no reports that any distress call went out until after the ACX Crystal came back at 17:30Z, an hour after the collision. ... There is a 14 minute gap that I can't explain, did they turn off AIS? ... When I was in command, I had a monitor installed next to my bed that replicated one of the main command-and-control pictures available to my watch-standers. This monitor was a “God’s-eye view” straight down on my ship out to 8 nautical miles. My ship was in the center, and other ships in the area were represented by ship avatars which indicated both their direction of movement and their speed. When the bridge watch called and woke me up to report a nearby ship that would pass close enough to be of interest, I swiveled this monitor away from the wall and matched what they were telling me with what the “radar” picture was telling me. Virtually all the time, the stories matched. Now and then, I saw something in the radar picture that was not reflected in the narrative from the bridge and asked for clarification. On occasion, I was concerned with a conflict and shuffled up to the bridge to have a look for myself. A common error is to mistake an overtaking situation and a crossing situation, as we see in the “overtaking” situation graphic above this paragraph. A ship being overtaken is the stand-on vessel and so maintains its course and speed. If the other ship involved is to its right side generally, the second ship may believe the situation to be a crossing situation — and since it is to the right, it would be the “stand on” vessel. Two ships believing they are equally the stand-on vessel is a recipe for disaster. Situations like this are compounded at night. On occasion — again, because of the presence of humans in the decision loop — plainly obvious situations are misinterpreted because of confirmation bias: Anomalous information might not match the mental picture that a bridge watch-stander has developed, and is then ignored. A classic case of this happening was the October 1996 collision involving the USS Theodore Roosevelt (CVN 72) and the USS Leyte Gulf (CG 55). Essentially, the Roosevelt “backed down” into the Leyte Gulf while, unbeknownst to the Leyte’s watch-standers, conducting engineering drills. The radar picture told a story of a massive aircraft carrier moving astern at a high rate of speed, but the mental picture of the bridge personnel on the Leyte — who did not know that such a maneuver was going to happen — disregarded what their system was telling them, and they failed to turn in sufficient time to avoid collision. ... 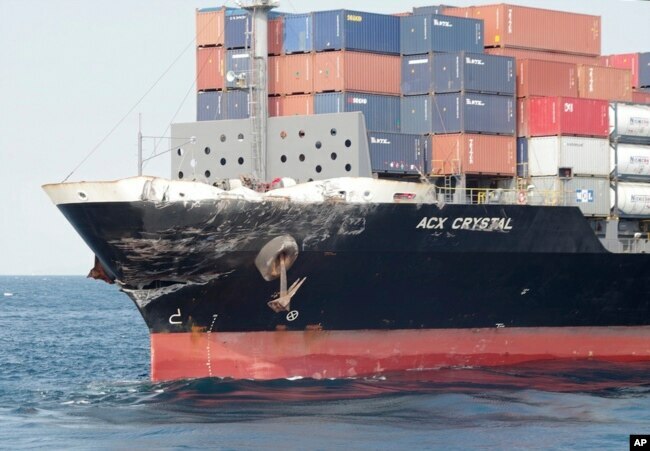 Using formulas from the ABS source cited here, the International Maritime Organization (IMO) standard for the container ship involved in this collision appears to be approximately 2.5 nautical miles to stop (at 15 knots) and over a half mile turning radius. The 9000-ton destroyer in question is quite nimble comparatively, but our automobile-infused understanding of last second swerves or the power of anti-lock brakes simply fails in this context. Decisions to avoid collision must occur far earlier and at far greater distances than in an automobile, and the longer that decision is delayed, the fewer options for avoidance will exist. Without early action, all either ship can do is to try and minimize the angle of impact. 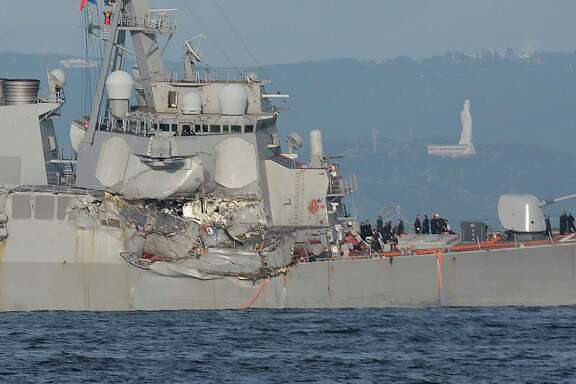 The names of the deceased: Gunner’s Mate Seaman Dakota Kyle Rigsby, 19, from Palmyra, Virginia; Yeoman 3rd Class Shingo Alexander Douglass, 25, from San Diego, California; Sonar Technician 3rd Class Ngoc T Truong Huynh, 25, from Oakville, Connecticut; Gunner’s Mate 2nd Class Noe Hernandez, 26, from Weslaco, Texas; Fire Controlman 2nd Class Carlos Victor Ganzon Sibayan, 23, from Chula Vista, California; Personnel Specialist 1st Class Xavier Alec Martin, 24, from Halethorpe, Maryland; and Fire Controlman 1st Class Gary Leo Rehm Jr., 37, from Elyria, Ohio. The other thread I was following has been abruptly closed without explanation. I did get some private feedback that my thinking above about the point of impact is now corroberated by the Japanese. Apparently Navy sources have gone silent. From someone with excellent credentials who I know personally. ABC notes Japanese CG and ship owner now support earlier time of impact. US Navy still going with an hour later. Ships on autopilot don't make sudden turns so the question is was the sudden turn by the container vessel an attempt to ram the destroyer or an attempt to avoid the collision. I expect it was the latter. The fact the radio room of the Fitzgerald was flooded may explain the delay in reporting the collision but I have to wonder why a combat vessel has all it's communications equipment in one room without any backups in another part of the ship. Lots of questions but few answers as of now. vtsnowedin wrote: Ships on autopilot don't make sudden turns so the question is was the sudden turn by the container vessel an attempt to ram the destroyer or an attempt to avoid the collision. I expect it was the latter. The fact the radio room of the Fitzgerald was flooded may explain the delay in reporting the collision but I have to wonder why a combat vessel has all it's communications equipment in one room without any backups in another part of the ship. A 'sharp turn' in a massive cargo ship is usually measured in kilometer size turning radii, not something you do to target a small maverable ship like a Destroyer. VT the photographic evidence is pretty clear the Fitz was attempting to run across the bow of the container ship (CS). When they struck the CS was pushed right, she may well have been turning right to avoid the Fitz. That's why you see the high speed 90° starboard turn, her bow was pushed to starboard. If anything the CS was turning AWAY from the Fitz, and she came back to render aid. That previous story about the CS wandering around and making a U turn befor the impact is nonsense. It was based on a 2:30 am impact time as first reported, not the 1:30 impact time which has now come out. That is the scenario i described above, early in the thread. When the alt. description came out it confused me and made no sense according to the AIS track. The new story is totally consistent. Whatever happened the CS did NOT try to ram the Fitz. Even if it did the Fitz should never have put herself in that vulnerable position. Some one the Fitz messed up bad. Instead of speculating, I wondered about the history. I wondered how frequent naval accidents are, to try to put some context into this. Looking at the chart on the final page, it looks like from '45 through '88 that there were roughly thirty-ish such accidents a year on average. Even with all the various naval ships running around on patrols or missions, that seems like a LOT compared to what I would have guessed. With Greenpeace as the source, there may be bias against the military, of course. I didn't easily find comparable more modern data. The data I found was more general (overall mishaps for the Navy, including aviation or on land, for example), etc. And there are a bazillion hits for the current event which makes searching have the needle in a haystack flavor. Which is why I think it was the latter. ....... The new story is totally consistent. Whatever happened the CS did NOT try to ram the Fitz. Even if it did the Fitz should never have put herself in that vulnerable position. Some one the Fitz messed up bad. I don't like being told stories when we should be receiving facts. Stories change, facts don't. I think you have it right that the CS did nothing wrong which leaves my original question about how in the hell a US Navy warship with a crew of 300 sailors has nobody manning the radar while under way and cant see a mega sized radar target approaching at cargo vessel speed and give it a wide berth. And, after the Cole in incident, where some Yahoo's destroyed a ship by coming up to it in a rubber boat and exploding, they are supposedly to maintain a defensive posture at all times. The best rationale I've heard is that they were so busy with tracking more distant targets they lost situational awareness. Apparently this is what occured in a similar incident in the Straits of Hormuz a few years ago. "whatever is not ordered is forbidden "
gCaptain article discussing how the two ships operate. The age vs. responsibility of many of the young people doing tough jobs in the military is daunting. I remember watching interviews with soldiers in Iraq, early in the second Iraq war. The guy was a 19 year old, who had been a CLERK AT JC PENNEY prior to serving. And he was handling something that looked big, complex, and very dangerous, like maybe a 50 caliber heavy truck mounted machine gun. And here I am, basically refusing to go into JC Penney because of how poorly it's run, including the way they train their staff. For me something clicked at that point. Could this 19 YO clerk, (who I'm sure is a very nice guy and I respect his bravery and appreciate his service) REALLY do his very dangerous, complex, job well under stress, consistently? Really? When stateside he isn't allowed to even make minor decisions about sales or returns without consulting his 25 year old high school educated boss? Could thousands of his peers in similar jobs all do so, or even a very high percentage? I have huge doubts. It's not the soldiers' fault - they're presumably doing their jobs to the best of their ability and following orders. It's the system's fault. Incidents like this confirm to me that despite all the precautions and efforts, the system has gaping holes in it. Young folks can do all kinds of complicated tasks and do them well. The genius of our military service is that we need to rely upon very average young folks to do complicated things. It happens through training and reppitition. It's the process. Commercial businesses don't work on that model, can't afford to. But you may have a point that we have pushed the technology to a point where it no longer works. One new series navy ship had some very expensive recurrent machinery problems. They blamed the engineering staff who were not properly trained to service the systems. Ships have been running into each other since we built the first one. Its almost always due to negligence on someone's part. The investigation will determine what caused it. To me its rather amazing that you can take a civilian and train him in the art of war in a very short time and get as good of results as you do. Humans learn how to conduct war and use complex systems very rapidly. Its as though we were born to do it. Built for war, yup pretty much. Baked in our genes. And yes ships have been running into one another for a long time. . That is a very lame excuse for this. Hell, I hit a bouy last year. My fault. Poor management occurred long before the "crunch." The destroyer should not have come close to the ship. People screw up, we know that, therefore you provide yourself some wiggle room. Commercial Captains talk to one another all the time, they discuss how to pass one another. Navy ships frequently don't talk to the commercial ships. Therefore it's on them to be especially careful. Cog wrote: Ships have been running into each other since we built the first one. The first collision could not possibly have happened until after they built the second one. Just saying.